Inhabitants Seed Weed, Thorn Weed, Lurchin, Slithervine, Treasure Pest, Ka-Bloom! The Ancient Waterworks is an old, decrepit structure that Wario explores during the events of Wario: Master of Disguise. It is located in the middle of a jungle and houses the third Wishstone piece, which is hidden behind a large waterfall. Its inhabitants consist primarily of monstrous plants such as Seed Weeds and Thorn Weeds. The water here is purple and many platforms fall from the ceiling, damaging Wario if he gets hit. A Flower That's Drunk Up Power! 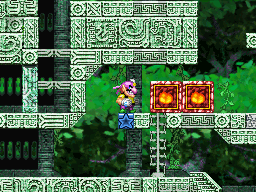 After being teleported to the Ancient Waterworks by Poobah the Pharaoh, Wario searches the ruins for the third piece of the Wishstone. Wario and Cannoli return to the Ancient Waterworks for unknown reasons. Carpaccio shows up and says that there are parts of an invention of his inside the ruins and that he'll give the invention to whoever finds them. This page was last edited on March 16, 2019, at 01:40.